The Fate/ series have been popular worldwide with different anime series and movies as well as games existing. 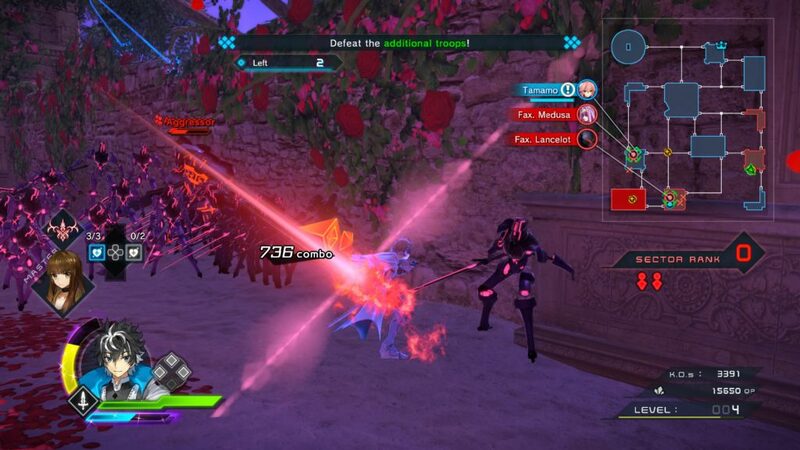 Fate/EXTELLA The Umbral star was a hack and slash game from the Fate/ series that was released in 2016 in Japan and in 2017 for North-America and Europe. We got to review Fate/EXTELLA The Umbral Star already, check out our review here. Now the follow up to The Umbral Star is here; Fate/EXTELLA Link will continue in the same universe and will showcase the same characters you saw in Fate/EXTELLA The Umbral Star. Fate/EXTELLA Link has been developed by Marvelous and has been published by XSEED Games and Marvelous. The Story plays out in SE.RA.PH, which is a virtual world built inside a supercomputer called the Moon Cell, named that way cause of its location on Earth’s moon. Expert hackers, called Wizards, and various A.I. support the integrity of SE.RA.PH. Many different figures of history and legends have been brought to life by the Moon Cell as scholars and warriors to help protect the virtual world as well. A war for the fate of the Moon Cell had been recently fought, this war is now over. More and more people are joining SE.RA.PH to flee from the disaster-ridden Earth. Even the A.I. are starting to get more conscious and more human-like. You start off walking around reminiscing together with Altera, who used to actually be a warrior and an enemy but got a second chance after the war. At one point you decide to return back home but when walking around Altera notices something; the area is new but that is not the only thing, you are surrounded by SE.RA.PH’s attack programs. 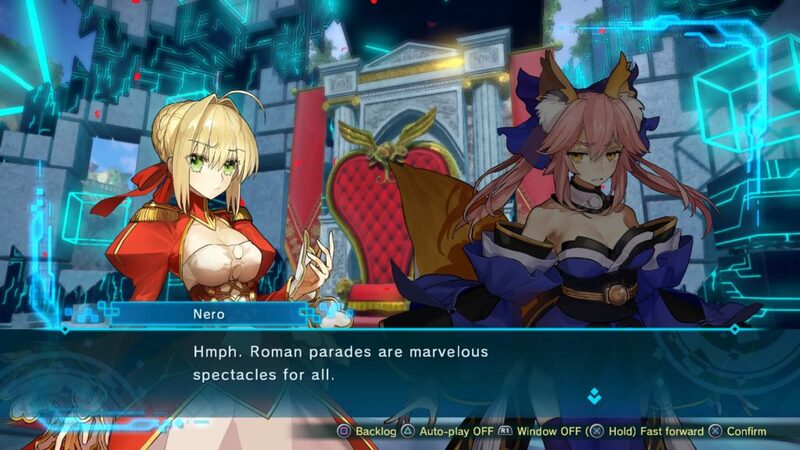 When it seems that you cannot outrun them you try to summon one of your heroic spirits or servants, Nero or Tamamo, however somebody you don’t know answers the summon instead. Luckily, he manages to fight off the attack programs easily. His name is Charlemagne and he is a sort of Rogue Servant that came to help out. Before he is able to take you and Altera home, Altera gets called by someone and she runs off. Once you get home you discover that “Rome”, the place you call home that is based on the city Rome, is in danger of being taken over. A guy called Rex Magnus has “brainwashed”, or “Oraclized” as they call it in the game, servants and is planning to take over SE.RA.PH starting with Rome since you’re the last master standing that would get in his way. So, there is no choice to fight and find more allies along the way to help battle Rex’s growing army. The story is told in bits and pieces and if you haven’t played the previous game or know anything of the Fate/ series then it might be a bit confusing with all the different terms. Luckily the game just uses the previous series as a background to tell this story, so you don’t need to know that much. The situation is easy enough to understand after while, so once into it, you can play without worry. The Graphics of Fate/EXTELLA Link look good but aren’t spectacular either. During the conversations, you get a 2D cut-out of the characters talking to each other and during the fighting part of the game, everything is in 3D. Unlike some other anime games, the 2D cut-outs are actually a bit animated, sadly only their eyes and mouth are animated. It might have been nice to also see a few different poses and not have the same pose for every conversation. During the fighting parts of the game, you are located in a series of rooms connected by “wind tunnels” so to say. These rooms have one theme with a few tiles that get repeated, but they still look a bit different compared to one another. At first, you fight in the same theme, but this does change when you change location. Music in Fate/EXTELLA is good and changes nicely depending on the situation you are at in the game. During conversations, it will be more calming but then during the fighting parts, and certainly when something dramatic happens, it will pick up the pace and play a track that is more exciting and dramatic. Sound effects are perfectly fine with logical magic sounds and nice slashing sounds when fighting. Of course, no anime game can’t really go without nice voice acting and Fate/EXTELLA Link is no exception. The voice actors did a really great job conveying the emotions, and “evilness” of the characters. 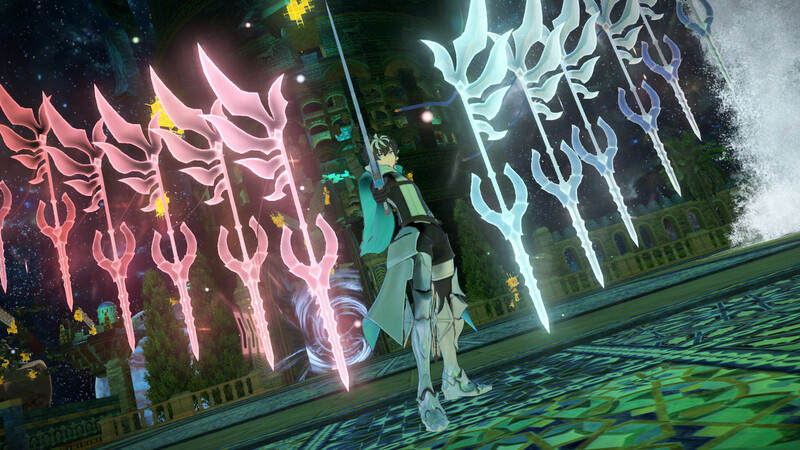 Fate/EXTELLA Link is an action game where you take on the role of the “master”. A master is someone who can summon servants to help them in battle. As a master, you don’t actually fight yourself, you just overlook the battle. You, the player, will take control of one of the servants. As you start the game, your first battle is actually the tutorial where you will fight with the rogue servant: Charlemagne. 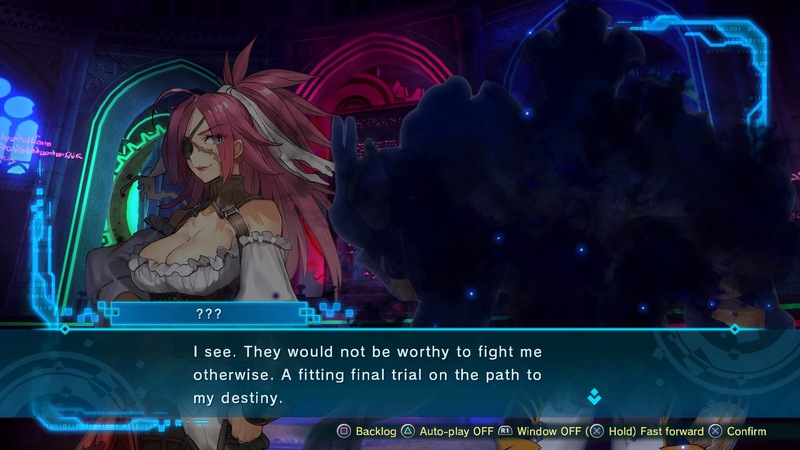 The game mostly consists of two parts; “conversations” which is a sort visual novel style and then “battle” where you fight in a 3D environment. During the conversations, you will meet more characters and get story parts. During the battles there will also be some conversations happening both in a sort of announcement/radio way and in the visual novel style. You’ll quickly notice that conversations certainly drive this game forward. It’s as easy to say that approximately half the game is all about the conversations. While the action sequences are there, this game is also very reliant on its story value.The conversations luckily are not boring and dreadful at all and just mostly tell of the situation at hand. As you take on the role of a servant, you will get a few normal attacks and then stronger abilities. You can use the normal attacks to do stronger combos with one another. There are a few special abilities that you have which are stronger attacks, however some of these are a bit hard to aim. If you activate a special attack in a certain direction, more than once it actually triggers in a totally different direction. The latter could be annoying if you totally miss the strong enemy you were aiming for. You also have Moon Drive, which you can activate after the gauge fills up, which is a stronger mode. 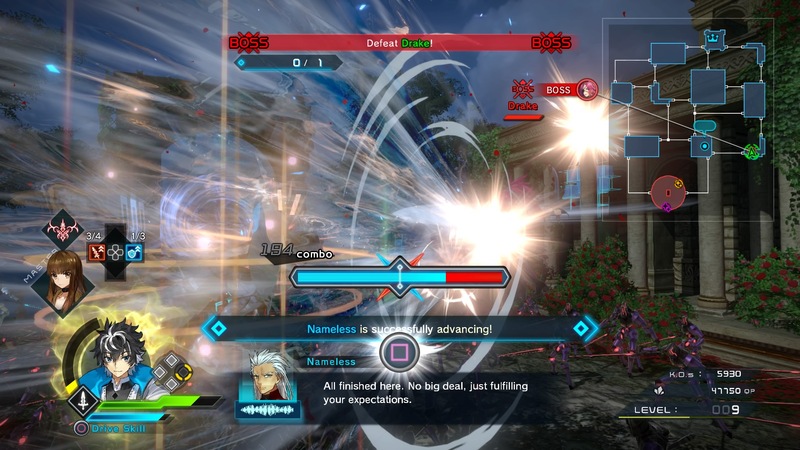 The Moon Drive also has a specific attack, called Drive Skill, which can be used when in this overdrive status. Lastly, you have the most special ability, your Noble Phantasm, which has a gauge like the Moon Drive but is harder to fill up. Your Noble Phantasm, depending on the Servant you are using, is a powerful attack that could take out an entire room at once. Before the battles, you will be able to use one of Charlemagne’s Noble Phantasm “the flying fortress” as a base of operations. There you will be able to talk to your servants and raise your affinity with them by doing so. You can also change their costumes, if you have any, and equip different skills. Before you start the battle, you can change with which servant you want to play and once you have chosen who, you can choose a support team which will sometimes help you out. Characters will also have certain quests for you, which if you complete them, they will like you more. You can however only choose five so you will have to choose the characters you want to like you the most. 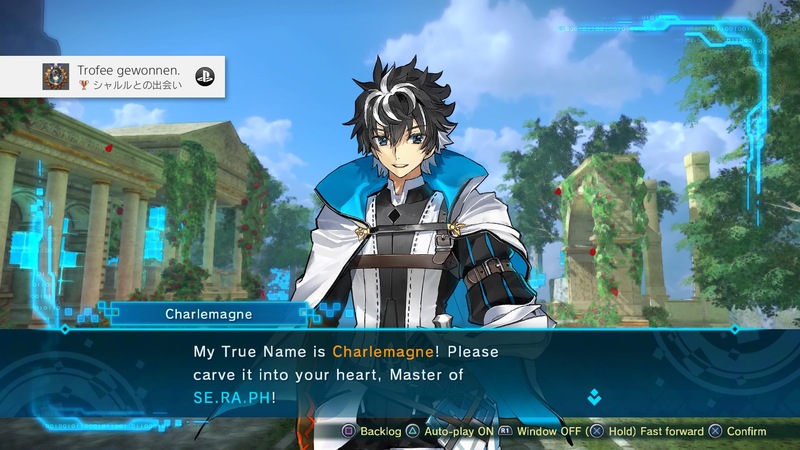 Fate/EXTELLA Link is a fun game where you’ll battle for the fate of SE.RA.PH once again. If you are curious to play this game, it might be recommended to play the previous game Fate/EXTELLA The Umbral Star since even though the story is fine on its own, it is a bit confusing at the start and would be more fun if you actually know the characters. 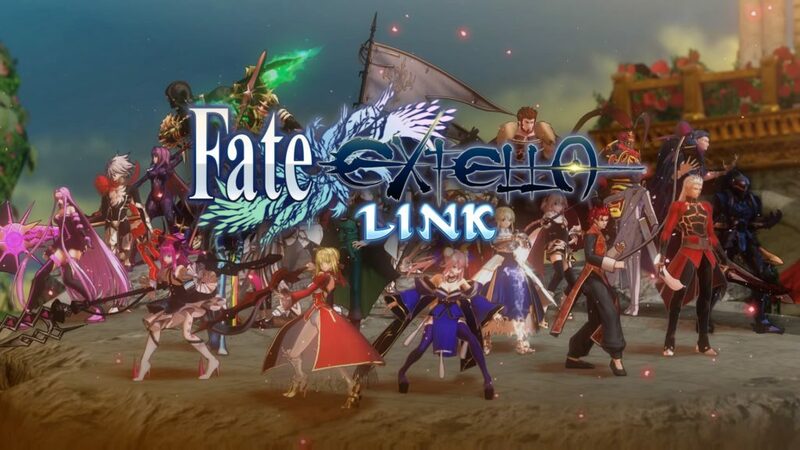 If you dislike Visual Novels, it would be recommended to stay away from this game but if you don’t mind them and you like the Fate/ series then give Fate/EXTELLA Link a try.